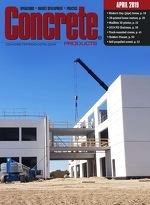 With more than 600,000 net square feet of indoor and outdoor exhibit space harboring 1,300-plus manufacturers, material suppliers and industry service providers, the World of Concrete is poised for its best staging in six years. Ahead of a transition to new owner Informa Exhibitions, longtime operator Hanley Wood Exhibitions projected show attendance exceeding 50,000 this year. The 2015 World of Concrete, February 3-6, will feature plant and fleet equipment, concrete mix and finishing materials, plus construction machinery and tools across the Las Vegas Convention Center. An extensive education, training and certification program runs February 2-6, offering mostly 90-minute or three-hour sessions geared to concrete and masonry professionals. Among new sessions are “Proper Use of Slab Reinforcement Systems” (Master Builders veteran Terry Holland, presenter); “Green Building and Sustainable Design” (Texas Aggregate & Concrete Association’s Richard Szescy); “Producing High Quality Precast Concrete Countertops” (Concrete Countertop Institute’s Jeff Girard); “Troubleshooting for the Concrete Producer” (BASF Admixture Systems’ Dr. Charles Nmai); “Quality Assurance: Your Lifeline to a Better Project” (Precast/Prestressed Concrete Institute’s Dean Frank, Brian Miller); and, “Concrete Waits for No One! Slump Loss, Setting, Shrinkage & Strength Gain” (Cornell Professor Ken Hover). Ready mixed and manufactured-concrete producers are well represented in the 2015 World of Concrete Association Industry Training schedule: Interlocking Concrete Pavement Institute, PICP Specialist Course; Ready Mixed Concrete Association of Ontario, Concrete Standards, Specs, Materials & Practices; Tennessee Concrete Association, Pervious Concrete 2-Hour Field Project for Installer Certification; American Concrete Pipe Association, ACPA Concrete Pipe and BoxCulvert Design & Installation; and, Precast/Prestressed Concrete Institute, PCI Certifed Company Auditor Training & Certification and PCI Quality Control Technician/Inspector Levels I & II. Full education, training and certification session, outdoor demonstration and exhibit hall schedules, plus registration, can be obtained at www.worldofconcrete.com. The 10th annual auction benefitting Concrete Industry Management programs at Middle Tennessee State University, Murfreesboro and four other schools will be held February 4 in Las Vegas Convention Center room N262; 11 a.m.–12:45 p.m. silent bidding; 1 p.m. live bidding. Mack Trucks and McNeilus Cos. have teamed up again to donate the auction centerpiece, dispatching to Las Vegas this year an 11-yd. Bridgemaster mounted on a Granite GU713 set-forward axle model, with MP7 365-hp engine and Allison RDS 4500 automatic transmission. The ACI Foundation’s Strategic Development Council is sponsoring a February 2 presentation and project recognition forum on self-consolidating concrete, sharing best practices and success stories by concrete industry experts, engineers, contractors, and owners. The event will take place at the Las Vegas Convention Center, 1–4:30 p.m. The SDC’S Accelerated Technology Implementation team champions SCC in cast-in-place construction, deeming it an Industry Critical Technology.